It can sometimes be difficult to visualize the reason for color shift in color space conversion. The best way to see the color differences between the CMYK and RGB color spaces is to look at a color gamut comparison chart. The chart to the left plots the visible color spectrum as the large "horse shoe" area, and within this is a plot of the CMYK colors, and the RGB colors. 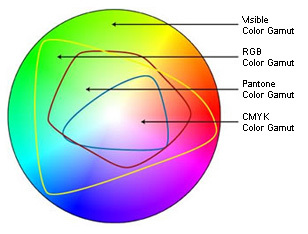 You can see that in some areas the RGB color space is "outside" that of the CMYK space. It is these colors that will be affected by a conversion from RGB to CMYK. Digital art that is comprised of spot colors (e.g., special colors: any colors that are not CMYK process colors), generally require conversion to the CMYK color space to enable file use. Because color gamut's for spot color libraries, such as those associated with the Pantone Matching System (PMS), usually extend beyond the ranges of the CMYK color gamut, some spot colors may not be represented effectively using CMYK process inks.